Every angler wants the best tackle and equipment they can get their hands on; it’s the only way to fish with confidence. But because most anglers have budgetary limitations, you can’t just find the very best model available and plop down the credit card. You have to find the best equipment you can at a price point that you can afford. Fortunately, you don’t have to spend a fortune to find a fish finder that will help take your fishing to new levels. In fact, there are a number of high-quality fish finders available in the under-$500 price range. But different manufacturers prioritize different features and capabilities when designing their products. Some choose to funnel resources into producing the best display screen possible, while others seek to provide anglers with technological capabilities that aren’t available in other comparably priced products. This means that you’ll need to compare the various models available at a given price point and try to select the one that will provide the most value to you. We’ll dive into this issue below and examine the five best fish finders that you can usually find less than $500. No matter your budget and specific needs, it is important to understand some of the most helpful characteristics and capabilities available in modern fish finders. Only then can you decide which features you want, and which features you’d be willing to sacrifice to remain under budget. A high-quality display screen can help you notice tiny details that you may otherwise miss. Also, a high-quality display can help make a fish finder more enjoyable to use – nobody wants to squint at a screen all day. Generally speaking, you want the largest full-color screen you can afford, and, if possible, you want one that is sealed to prevent fogging. Scanning sonar technologies provide anglers with a much crisper view of the world beneath the water, so they should always be a priority for anglers shopping for fish finders. There are two basic types of scanning sonars: down-imaging and side-imaging. Down-imaging sonars are more common at low price points, but there are a few find fish finders under $500 that provide side-imaging capabilities. The best modern fish finders are designed to connect to smartphones, tablets and other digital devices. Such capabilities not only allow you to control your fish finder from anywhere on the boat, they enable you to send maps, screenshots and other data from your fish finder to your other digital devices, so you can share this information with friends or upload images to the internet. The geographic information provided by GPS-enabled fish finders help you to better understand the lake, river or sea in which you’re fishing, which will ultimately help you to catch more fish. Some of the best GPS-enabled fish finders also feature chart-plotting functionality, which will help you navigate the water with precision. You want to spend your time fishing and leveraging the information provided by your fish finder, not fighting with your equipment and trying to navigate an endless maze of screens and settings. Accordingly, you’ll want to prioritize those units that come with intuitive interfaces and operating systems. Many of the fish finders available in the under-$500 category provide a wealth of information, which is displayed in different ways on the screen. But to take advantage of the information provided, you’ll need a fish finder that can display this information in helpful ways – preferably in a split-screen format. Most of the best fish finders allow you to do exactly that. You may, for example, want to view the CHIRP sonar readout on one half of the screen, while viewing a GPS overview on the other half. Conversely, you may want to view your side-scanning sonar on one half of the screen, while viewing your down-imaging sonar on the other. Anglers who fish small or uncharted waters are often at a disadvantage, but several fish finder manufacturers produce models that allow you to make custom maps of the water. This can be incredibly helpful, as it will allow you to find and chart river channels, expansive flats or deep-water points, among other things. Some manufacturers incorporate proprietary scanning technologies into their fish finders. A few, for example, utilize much higher frequencies to provide greater detail. However, these types of features are often difficult to find in fish finders below $500. Historically, fish finders utilized physical buttons, but many modern models now come equipped with touch-screen displays. Neither interface is inherently better than the other, so you can just pick the type you prefer. Do note that while touch-screen interfaces often allow anglers to navigate the various display screens much more quickly than button-controlled models do, touchscreens don’t work well for those with wet or gloved hands. Nevertheless, touch-screen displays are somewhat rare at the sub-$500 price point. Sometimes, you’ll want to see every hint of a sonar return on your screen, so you won’t miss small fish or structural details of the lake. But at other times, you’ll want to crank the sensitivity down to reduce screen clutter (such as when you are fishing in choppy water). 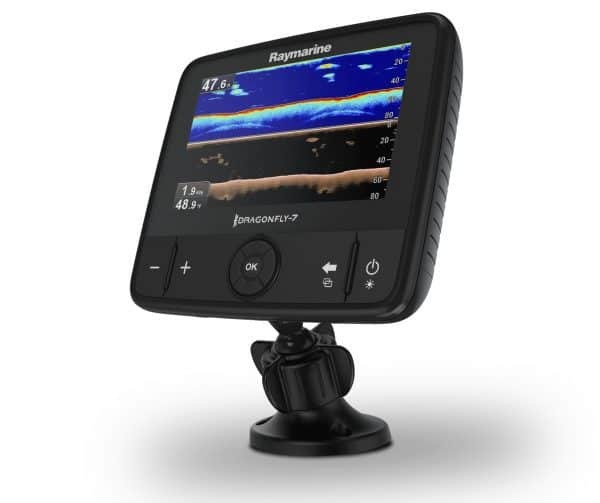 Most high-quality fish finders will allow you to tweak the sensitivity, but the Humminbird HELIX Series comes equipped with a special feature (which they call SwitchFire) that allows you to switch between maximum and reduced sensitivity with the “flip of a switch” (although technically, it is accomplished via the push of a button). While many fish finders can be connected to your phone, tablet or desktop computer via physical cords, the best units allow you to interact via WIFI or Bluetooth technologies. This eliminates the needs to use hardware of any kind when transferring data and makes the procedure quick and easy. Some fish finders feature predictive software that analyzes historical fishing and weather patterns to provide you with location recommendations. Such functions can take the guesswork out of fishing and help you find productive spots more quickly. Many HELIX units provide this type of functionality (Humminbird calls it SmartStrike). Traditionally, sonar units displayed fish as small arcs on the screen. And while you can learn to recognize and interpret these arcs with practice, it is easier to use a fish finder that displays icons rather than arcs. For example, most HELIX fish finders come with Selective Fish ID, which replaces arcs with fish-shaped icons. Below, you’ll find our choices for the five best fish finders of 2018. Be sure to select the model that will best fit your fishing needs and provides the features and characteristics that will help in your unique circumstances. Display Size - Diagonal 5"
While the HELIX 5 CHIRP SI GPS G2 comes equipped with the smallest screen of any of model in this review, it’s impressive slate of features may tempt many anglers to sacrifice a bit of screen size to get access to the high-end capabilities it provides. Unlike the HELIX 7 CHIRP DI GPS G2, the HELIX 5 CHIRP SI GPS G2 provides both down- and side-imaging capabilities. 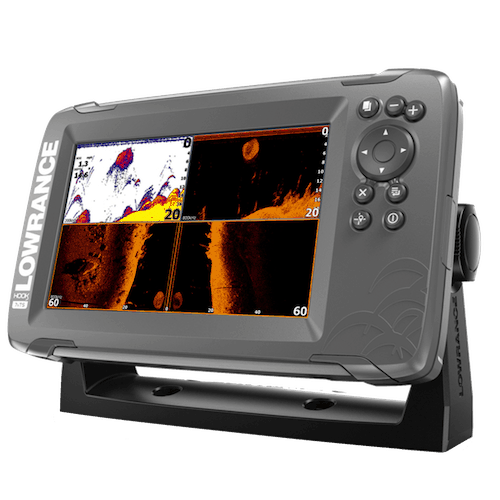 Most comparable units provide down-imaging capabilities, but only two other models at this price point (the Lowrance Hook2 and the Garmin STRIKER 7) provide side-imaging capabilities. This makes the HELIX 5 one of the best fish finders for scanning vast swaths of water, as the side-imaging sonar function allows you to view 180 degrees of water around your boat. Capable of resolving images to depths of 1,500 feet, the HELIX 5 penetrates deeper than any of the other fish finders in this review. This makes it the best option for offshore anglers (or those who fish in deep freshwater lakes). It includes Selective Fish ID so that you don’t have to interpret arcs, and temperature and speed data are displayed on the screen. 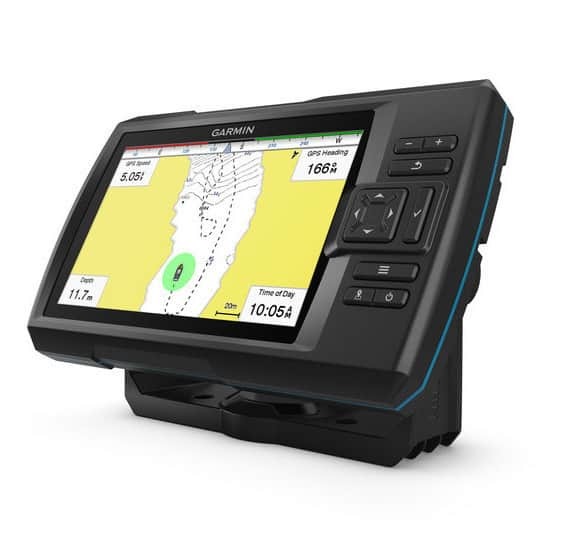 The HELIX 5 CHIRP SI GPS G2 comes equipped with a gimble-style mount, making it easy to see the display from anywhere on the boat, and, like the HELIX 7, it comes with SmartStrike technology, which provides you with location recommendations. AutoChart Live allows you to make your own custom maps on the fly, and SwitchFire technology allows you to customize the unit’s sensitivity to match the water conditions. Display Size - Diagonal 7"
The HELIX 7 CHIRP DI GPS G2 is a feature-packed fish finder, which provides anglers with a number of effective tools to find and catch more fish. The HELIX 7 comes with most of the primary capabilities an angler would want, including CHIRP sonar, down-imaging capabilities and custom map-making functionality (called AutoChart Live). The HELIX 7 CHIRP DI GPS G2 also features SmartStrike, Humminbird’s proprietary fish-locating and movement-predicting technology. This way, you don’t have to hunt around blindly for a good fishing location – you can simply follow the recommendations provided by the HELIX 7. And once you find a few good locations, you can mark and revisit them later by using the included waypoint feature. The HELIX 7 CHIRP DI GPS G2 images clearly to depths of 600 feet, and displays this data in exquisite detail, thanks to the 7-inch high-definition display screen. 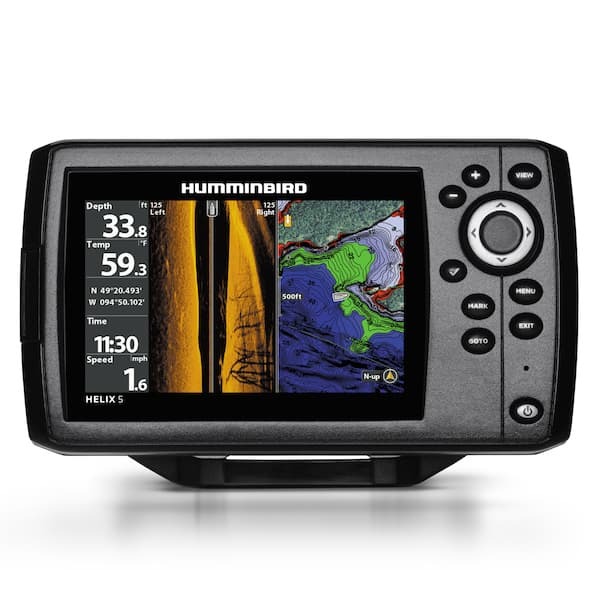 The HELIX 7 features a micro SD card slot so that you can transfer data to and from the unit easily, and it is also fully upgradable, which means that you’ll be able to quickly and easily download software updates via the Humminbird website. Like most other GPS-enabled fish finders, the HELIX 7 will display your travel speed, and the built-in temperature probe will allow you to search for those areas that are most likely to hold fish. The HELIX 7 features a gimble-style mount so that you can tilt and swivel the display screen as necessary. Winner of the Best Overall Fish Finder Award, the Lowrance HOOK2 7x with TripleShot Transducer and GPS Plotter provides most of the high-end features available in the other products at this price point, without forcing you to compromise on screen size. Designed to be very easy to operate, the Hook2 features a very intuitive interface, which is controlled via physical buttons. A true plug-and-play fish finder, the HOOK2 provides quick access to the various display modes, and the sonar unit automatically adjusts itself to provide the best image for the conditions and type of sonar signal you select. You can even view four different screens at the same time, thanks to its impressive split-screen function. The built-in GPS plotter provides geographic information and enables you to navigate the water with confidence and quickly reach your desired location. You can store up to 3,000 different waypoints with the HOOK2 and it also allows you to store 100 navigation routes. But the most impressive thing about the HOOK2 is the TripleShot Transducer, which gives you the chance to use wide-angle, CHIRP and scanning sonar modes (including both down- and side-imaging). The Lowrance HOOK2 comes with a gimbal-style mount, but you can also mount it on your dashboard if you prefer. It images clearly down to 500 feet (300 feet in scanning sonar modes) and provides temperature data as well as a shallow water alarm. The Dragonfly 7 Pro is popular among anglers who prioritize display quality, yet still want as many features as possible. It provides some of the sharpest and most detailed images of any fish finder in this price range, and the optically bonded LCD screen is very easy to see, no matter the weather conditions. In fact, Raymarine guarantees that the display screen will never fog up. But it doesn’t matter how good the display is if the fish finder doesn’t feature a high-quality transducer; fortunately, the Dragonfly 7 Pro comes equipped with wide-spectrum CHIRP capabilities. This provides greater detail than traditional CHIRP sonar circuits do. The Dragonfly 7 Pro also provides down-imaging capabilities. However, unlike most other fish finders, the Dragonfly 7 Pro utilizes ultra-wide DownVision, so that you can image more of the lake bottom than most other fish finders allow. The Dragonfly 7 Pro images clearly down to 600 feet, making it suitable for most freshwater and nearshore anglers. It is Wi-Fi enabled and works in conjunction with Raymarine’s Wi-Fish mobile app, which makes it easy to transfer information of control the device via your smartphone or tablet. The Dragonfly 7 Pro also provides full GPS and custom-map-making capabilities, and it features a ball-and-socket mounting design, which allows you to easily twist and turn the display as you move around the boat. Like most other Garmin fish finders, the STRIKER Plus 7sv provides high-quality mapping and chart-plotting capabilities, while still offering the types of high-end features anglers want in fish finders at this price point. You can not only determine your location and speed via the GPS circuit, you can also store waypoints, which will allow you to revisit productive fishing spots in the future. Equipped with CHIRP sonar to provide an exquisite view of the structure and fish below, the STRIKER Plus 7sv also provides both down- and side-imaging capabilities (although they call these modes ClearVu and SideVu, respectively), so that you can appreciate the finest details of the waters beneath and beside your boat. A thoroughly modern fish finder, the STRIKER Plus 7sv also comes with WIFI capabilities, so you can control and interact with the device via your smartphone or tablet. It also works in conjunction with Garmin’s ActiveCaptain App, which provides further control at your fingertips. Gamin’s Quickdraw Contours feature allows you to make custom maps of the waters you fish, and, unlike some other fish finders that provide only a limited amount of storage space, the STRIKER 7sv will store up to 2 million acres worth of maps. The STRIKER Plus 7sv also provides split-screen zooming capabilities and Fish Symbol ID, so you don’t have to interpret arcs – you can just look for the fish icons on the screen. As you can see, there are plenty of very capable fish finders available in the under-$500 category, and most of the leading units provide similar features and quality. This means that while you’ll likely be happy with any of the models detailed above, some will suit your needs better than others will. For example, anglers who prioritize features above screen size will likely want to consider the HELIX 5 CHIRP SI GPS G2. 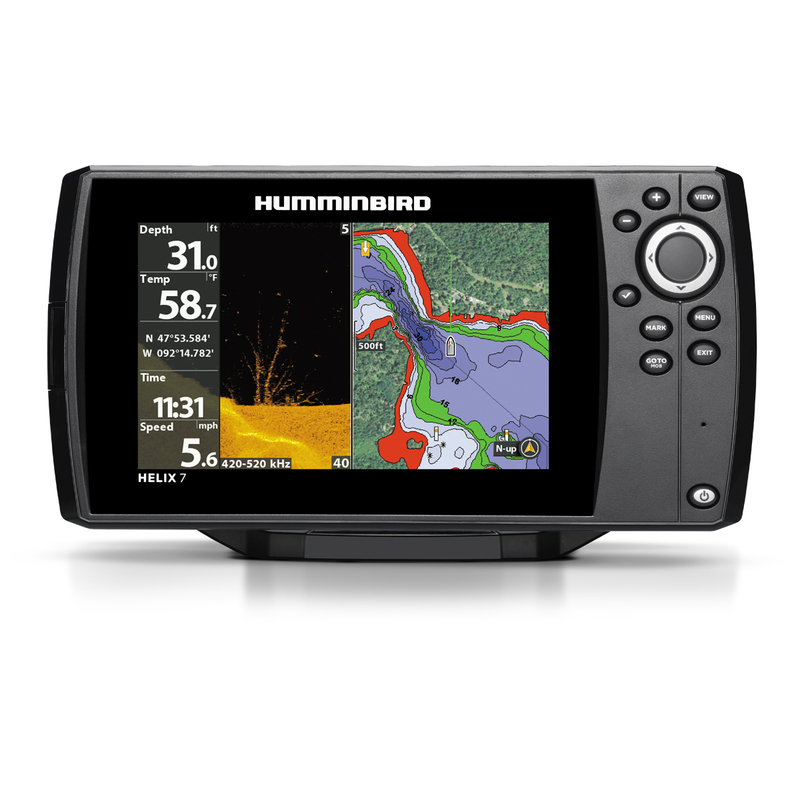 On the other hand, anglers who like the HELIX interface yet would prefer a 7-inch display screen over side-imaging capabilities would be well-served by the HELIX 7 CHIRP DI GPS G2. Those who want access to the best maps, charts and GPS capabilities would be wise to consider the Garmin STRIKER Plus 7sv, while those who want the very best possible display image will likely prefer the Raymarine Dragonfly 7 Pro. Nevertheless, the Lowrance HOOK2 7x with TripleShot is the best all-around fish finder in the category. It comes with a large, easy-to-see display screen and all of the map-making and GPS functionality an angler could want. It also provides both side- and down-imaging capabilities, so you can appreciate even the smallest details about the water beneath you. And the Hook2 7x manages to provide all of these capabilities and features while still costing about $100 less than the other models in this review. Accordingly, Fishing Tech recognizes the Lowrance HOOK2 7x with TripleShot Transducer and GPS Plotter as the Best Overall Fish Finder available for less than $500. Why Are Anglers So Entrepreneurial?